While I was preparing my latest installment of “Comics Prehistory,” I realized that my next installment, “Superman: The Secret Years” was a series I wrote about way back in the early days of this blog. In fact, I wrote this entry back on April 17, 2010, a little more than SIX YEARS AGO. So, enjoy this flashback re-post and I’ll be back in a week or two with the next Comics Prehistory book, Transformers #5. I honestly don’t remember when I bought my first comic book or what that comic was. I have vague memories of perusing the magazine rack at Greaves stationary in my hometown and coming home with an issue of The Amazing Spider-Man or Superman. At some point, I know that I got an issue of the Batman team-up title The Brave and the Bold sometime in the very early 1980s, so that might have been it. 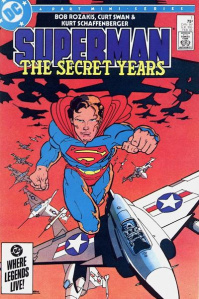 But Superman: The Secret Years #2 was the very first comic book that I remember buying at an actual comic book store.